One of Fruits de Mer's November 2013 vinyl releases is a cover of two classic Pink Floyd songs by Russian space rock band Vespero. Vespero has been fairly active since forming in 2003 and have appeared on several recent FdM releases: The Crab Freaks Out (2012), Fruits de Mer Annual 2013 (2012), and another of the November 2013 releases Shrunken Head Music. They also have a number of releases in their own right. On this Pink Floyd single, they have faithfully recreated and encapsulated the emotion and ambiance of "Careful with That Axe, Eugene." It is just that the vocals do not evoke the primal scream of the original. 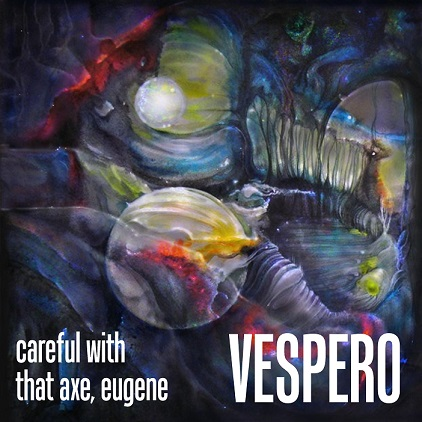 In contrast, Vespero's cover of "One of These Days" is slow moving and very cool reinterpretation of this song, but it also lacks the guttural impact of the original. It is difficult for a band to cover iconic songs and have them equal or surpass the originals. For young listeners unfamiliar with these classic Pink Floyd songs, the Vespero versions are great. But for those of us long in the tooth who grew up with these songs, the covers pale in comparison.